Honolulu must be paradise to restaurant chain owners. In this cosmopolitan city, all they need to do is swoop in with their "Open" signs and start taking orders. There's no need for them to define or explain themselves. It's all self-explanatory to those who grew up "chop suey," familiar with cuisines of both East and West. Max's of Manila fits right in as a restaurant born in Quezon City but informed by the West and now trying to make its way through the country whose cuisine it adopted. In the Philippines, Max's is known as "the house that chicken built." Its story dates to 1945, when U.S. occupation troops were befriended by Maximo Gimenez, whose house became a gathering place. The Stanford-educated teacher then decided to open a cafe where he could give the GIs a taste of home, serving chicken, steak and drinks. His niece Ruby managed the kitchen and cooked up fried chicken that attracted locals as well, and with more traffic and by popular demand, the menu expanded to include Filipino specialties. Max's has since expanded to include 100 restaurants in the Philippines, five in California and now, its first in Waipahu, in the big space formerly occupied by Price Busters. Think of Max's as the Ruby Tuesday or TGI Friday's of the Philippines, because that's the scale of the operation, and that makes its packed dining room all the more impressive. It amazed me because most homegrown Filipino restaurants never seem to outgrow the hole-in-the-wall phase. Even if they do expand, like Golden Coin, it's rare to see line-out-the-door business like at Max's. Not to stereotype or anything, but one individual of Filipino heritage said of the typical limited patronage, "That's because we can get the same food at any party." The parties have since moved to Max's. Groups are accommodated in booths or tables that can be brought together to squeeze in any number of siblings, aunties, uncles, cousins, in-laws, new friends, etc. The restaurant is kid-friendly, open to wedding, baptismal, birthday and other special occasions. So where do you start? If you're dining American style, every man for himself, Max's obliges with fried chicken combo meals. The bird is nothing as fancy as breaded, buttermilk-coated Southern-fried. Touted as tender, crispy and juicy, it's leathery instead. Like the tough pork adobo ($7.95) and thin-sliced lemon-sautéed beef steak ($8.95), the chicken suffers from the bland uniformity syndrome common to chain restaurants, but Max's legend has followed the restaurant from the Philippines, so yes, the dry chicken was flying out of the kitchen. 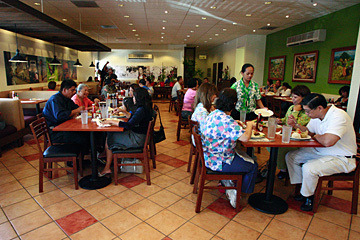 Diners drawn by the familiar name Max's of Manila crowd the Waipahu eatery. At left is part of the logo for the "house that chicken built." Get a half-chicken for $8.95 with a choice of rice, garlic rice or french fries; or $7.50 for a quarter-chicken with deep-fried lumpia and choice of starches ($8.50 for fresh lumpia containing bamboo shoots and veggies). Many seem to opt for the "Chopsuey Meal" ($7.95) featuring a quarter chicken with choice of starches and vegetables stir-fried with pork, chicken and shrimp. A kid's meal of chicken drumstick, spaghetti and ice cream is $4.95. Otherwise, start the party with Max's Teasers, a trio of appetizers for the price of one. At $7.50, this platter of deep-fried calamari, crispy tentacles (baby octopus) and a handful of Shanghai-style lumpia, or spring rolls, ranks as one of the best-priced pupu platters in town. It wouldn't be a party without a helping of crispy pata (deep-fried pig knuckles, $10.95/ $15.95) or lechon kawali (deep-fried pork belly with liver sauce, $10.95), similar to Chinese roast pork, crackly skin, fat layer and all. Balance the deep-fried content with a stir-fry of asparagus and tofu ($7.95), or an a la carte helping of chop suey ($7.50). For a different flavor, try the kare-kare ($9.95/$16.95), or oxtail stew in a smooth, mild peanut sauce. Then round out your meal with an order of pancit. Pancit Canton seemed too similar to the chop suey, so I opted for the palabok ($7.95) topped with boiled egg slices and an intense shrimp sauce colored bright orange with atsuete, and studded with bits of crunchy garlic and chicharon. For dessert there's leche flan ($3.25), but you can get a taste of the custard as one of the toppings for the shaved ice, preserved fruit and ice cream dessert halo-halo, which at $5.50 is big enough for two. We're so accustomed to Western food chains that when one comes at us from the East, it's still a surprise, but get used to it. Americans aren't the only ones with marketing know-how and aims to feed the world. » Waikiki: How much is too much?